The lighter side’s enduring and irresistible appeal—to composers and audiences alike—imbues this unusual collection of works, dating from Haydn’s time to the present. Double Bassist Ha Young Jung is a current doctoral candidate at Boston University. Jung studied at the Royal College of Music, The Juilliard School, Yale University and captivates audiences and music critics alike with her dynamic and engaging performances. As a soloist Jung has appeared with many prominent orchestras including Royal Philharmonic, Moscow Virtuosi Chamber Orchestra, Southbank Sinfonia, and Novosibirsk Symphony Orchestra. 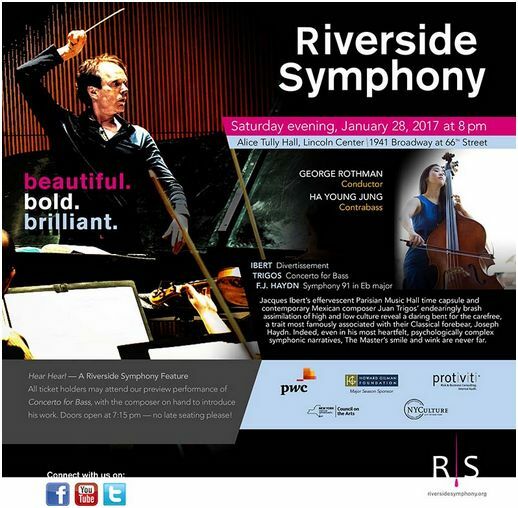 No user commented in " Riverside Symphony featuring Ha Young Jung, Contrabass "